I've been a police officer, currently work as a private investigator, and, in my youth, drove an armored car around Detroit for the princely sum of $6.49 an hour, but I don't consider myself a tough guy. The thought of being shot, even by a little teeny .22 bullet, makes me a little queasy. So I admit I don't understand those who have dismissively called the .327 Federal Magnum a "woman's caliber" or guns chambered in it "women's guns." If you look at the ballistics of the .327 Federal Magnum cartridge, it's pretty damn close to a 9mm +P, albeit with a smaller frontal area. The 115-grain .327 Federal Magnum features a published velocity of 1,300 fps, which is the exact same weight/velocity you'll find in just about every 9mm +P load made. Street results of the stopping power of this 9mm weight/velocity combination have been very good for a very long time. Taking advantage of this new cartridge is Smith & Wesson's new J frame, the Model 632 Carry Comp. Featuring a ported three-inch full-lug barrel, the smaller diameter of the .327 means the cylinder holds not the standard five but rather six rounds of magnum power. The 632 Carry Comp features a stainless steel frame and cylinder coated in a matte finish that closely resembles bluing. The serrated ramp front sight is pinned in place, and the rear sight is S&W's standard adjustable model. Between the longer barrel and the sharp edges of the adjustable rear sight, I don't consider this J frame a pocket gun like many S&W snubies, but it is highly concealable. Even though it obviously has a cylinder, my overall impression of the 632 was that it was flat. Forward of the front sight is the expansion port that gives this Carry Comp its name. S&W calls it PowerPort. Muzzle brakes and compensators work much better on high pressure pistol cartridges (.38 Super) than low (.45 ACP). Compensators direct the gas upward, and the faster the gas is going the more of a push downward on the muzzle there will be. As I did not have an unported .327 to compare it to, I can't say for sure how much the port reduced muzzle rise, but muzzle flip of the Carry Comp in rapid fire was not bad at all. I carry a hammer-shrouded J-frame .38 as a backup quite often, but I do not shoot it very much because even though it's an all-steel gun, this snubbie is a handful with anything more than target loads. I also find shooting .357 Magnums out of anything short of a Desert Eagle to be unpleasant, so I wasn't sure what to expect when shooting the .327 since it does carry the "magnum" moniker. I was pleasantly surprised. Full-power .327 loads have the felt recoil of .38 Special +P loads, and the Federal Low Recoil .327 load was even softer. The all-stainless 632 sports a full underlug on its three-inch barrel that adds a bit of weight up front. The 632's muzzle is ported to vent gases from the high-pressure cartridge upward, making the gun more controllable. t 1,400 fps, penetrated 24 inches of water, which is equivalent to 16 inches of 10 percent ballistic gelatin. This is far in excess of the FBI standard 12 inches. The Hydra Shok expanded to .53-inch and retained all of its weight, all while recoiling a hair less than a .38 Special +P round. And there are six of them in the gun, not five. If that's not enough to satisfy your personal defensive requirements, I suspect you're doing something wrong. The finger-groove rubber grips on the 632 Carry Comp were a bit narrow for my hands, but they are very concealable. If I were to carry the 632 I would throw on different grips, something like Craig Spegel's Boot Grips as they are a bit fatter. I have small, thin hands, but for some reason I like bigger grips. The trigger pull on the test model was fabulous right out of the box: nine pounds in double action and a hair under 21â'„2 lbs in single action. 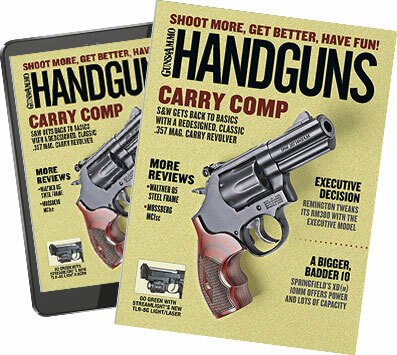 As Jerry Miculek says, "The revolver is still a good handgun of choice. There's no malfunction drill except pull the trigger again. It's simple, you pick it up, you pull the trigger, you put it down." In this case, the 632 Carry Comp holds six magnum rounds, is pleasant to shoot and is all stainless. Sounds just about perfect to me. The .327 Federal Magnum is a no-nonsense defensive cartridge, and the 632 Carry Comp gives you six of these rounds in a very concealable package.